The masterpiece was completed just weeks before the great Dutch artist died in France in 1890. 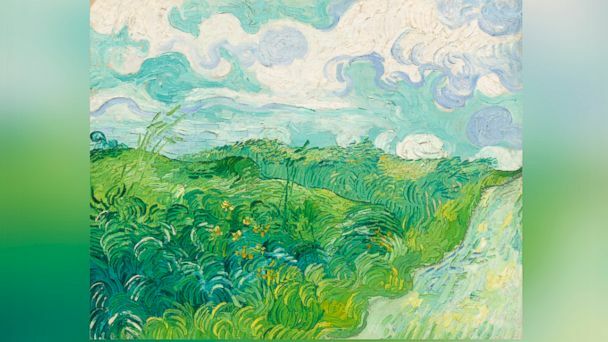 A spectacularly vibrant Vincent van Gogh painting was unveiled today at the National Gallery of Art in Washington after going private nearly 50 years ago. The work, "Green Wheat Fields, Auvers," is particularly exciting for art historians because the famous Dutch painter completed it just weeks before he died in France in 1890 at age 37. The oil painting had been in the private collection of late millionaire Paul Mellon, whose father, Andrew Mellon, founded the gallery in 1937. It had hanged, unframed, in Paul and his wife Rachel's home in Virginia until Rachel, 103, donated it to the museum earlier this year after its last public showing in 1966. It now lives in a beautiful gold frame but with just a little sign and no protective glass, next to a self-portrait of the artist. "Here in the gallery, it needs nothing. It is incredibly powerful," Mary Morton, curator of French paintings at the museum, said. The painting is large for van Gogh: two and half feet by three feet. It is incredibly textured and referred to as a "pure landscape," with no subjects. Instead of animals or buildings, it depicts only the northern French countryside: light green wheat fields, pale flowers, and a large blue and white, cloud-filled sky. The bright colors are interesting considering that the end of van Gogh's life is understood to be extremely sad and bleak. "He suffered but was soothed by nature," Morton said. "He's struggling, but he is feeling these incredible waves of joy." The colorful landscape stands out to those passing through, although many visitors today came particularly to see it. "Can you believe that was in someone's home," Greg Edwards, an aviation engineer from Herndon, Va.
Edwards brought his daughter to see the masterpiece, now open for everyone to enjoy. The masterpiece was completed just weeks before the famous Dutch artist died in France in 1890. This is a wonderful bright painting. A pity there is no bigger reproduction available, Roger, not yet at least. I will be on the lookout for one. I am afraid my last comment was not too bright. Here is a far better image from the the ABC News original article. Its that wonderful palette again. I'm inspired to try to copy the style.